Michael Conlin, the chief data officer of the Department of Defense will be featured as a keynote speaker during Potomac Officers Club’s 2019 Data Management Forum on April 10th at the 2941 Restaurant in Falls Church, Va.
During the forum, GovCon leaders of the public and private sectors will address the great challenges that surrounding data management. These include organizing, cleaning and tagging data as well as recruiting the best talent from across the globe. Conlin has been the chief data officer for DoD since July 2018. 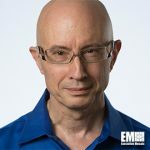 He’s responsible for department wide management, analytics and governance of data to meet the needs of DoD leaders for timely, reliable answers to critical business questions supporting the National Defense Strategy. He’s the driving force in the development and application of advanced analytics and artificial intelligence. With over 20 years of experience on five continents, Conlin has served organizations in a range of industries, business domains, technical domains, and government functions. Conlin has helped C-level Executives refine their IT Strategies for reform, business innovation and digital transformation. He’s served high-tech organizations as an executive and an individual performer. 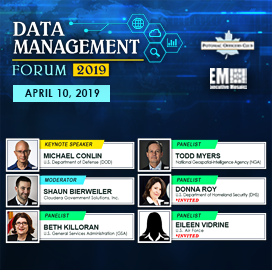 Don’t miss out on your opportunity to register for the 2019 Data Management Forum. You can register for the event right here.